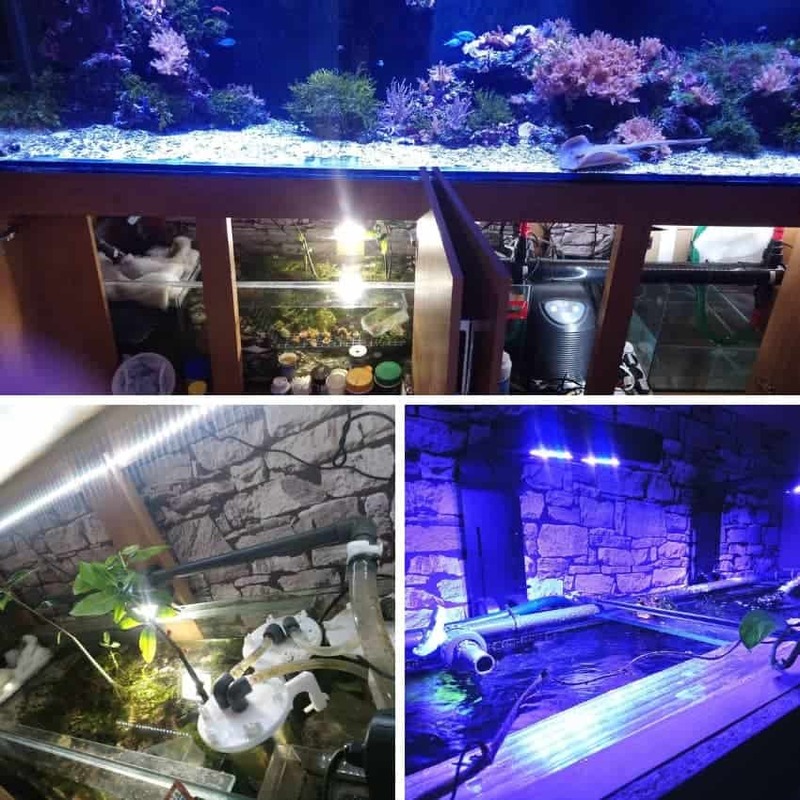 We get lots of requests every week from our readers who want us to feature and talk about their aquarium and we feature as many as possible. This week we simply had to feature this reef aquarium by Dave King, it is simply stunning and deserves the feature spot this week. 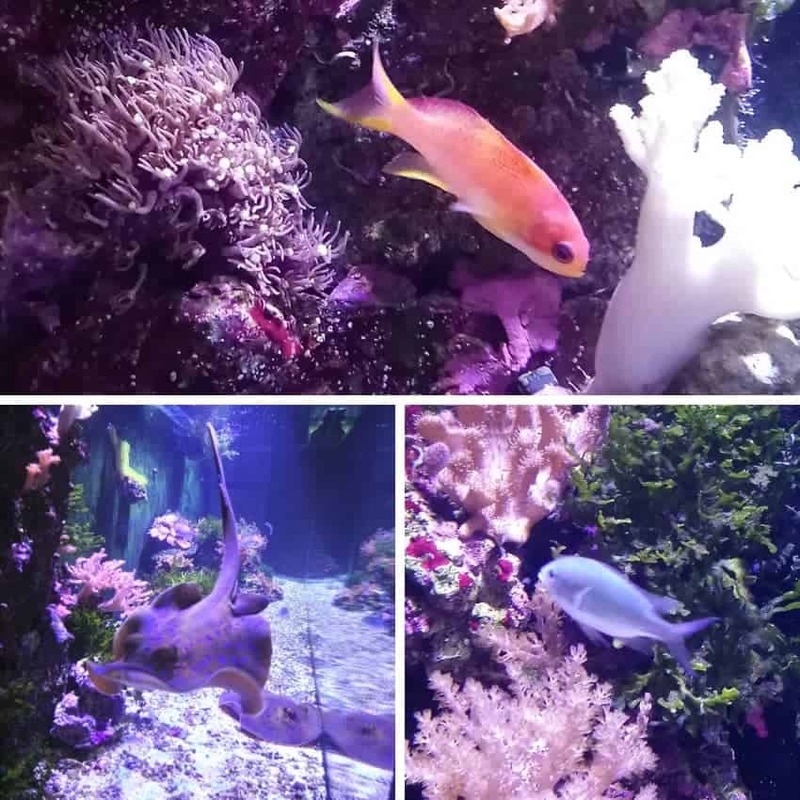 Dave is an experienced aquarist and has spent an absolute fortune over the years on his aquariums which you will see when you look at the photos and videos within this article. He has many aquariums and has even installed a huge cylinder tube style aquarium. 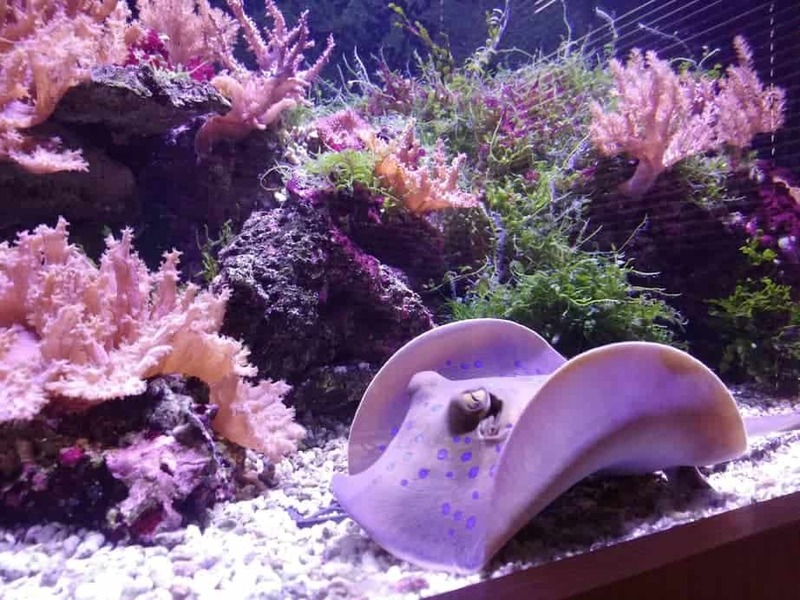 The type you only see in public aquariums, but in this article, we’ll focus on his main 9-foot aquarium which is home to an abundance of corals, fish, invertebrates and the star attraction his Blue Spotted Stingray. The main aquarium is 9′ x 3′ x 2.5′ and was custom built and took 8 men to lift into position. The tank also has a 6′ x 18″ x 20″ sump tank underneath within the stand and an auto top up unit. The stand was custom built and most of the setup has been done by Dave himself. Hours and hours of tweaking and setting up has accomplished this amazing home aquarium. Most novice aquarists will look in wonder at the array of equipment and technology within this setup, but don’t be put off if you’re thinking of starting your own saltwater aquarium. This setup is a result of years of learning and experimenting and results like these can only be achieved with either a shed load of money or by get someone professional to set it up for you or years of slowly learning the hobby and building it up year on year. The filtration units within the sump tank is world class and Dave has taken his time to ensure the perfect mix of technology and old school biology to ensure the fish enjoy perfect water parameters. I’m sure you’ll agree this is a dream setup and one that most fishkeeping can only dream of but not all the equipment used it the most expensive on the market. Dave has used his own skill which he has learned over many years to be able to use a mixture of inexpensive equipment in places where he knows he can get away with it and the more expensive tried and tested equipment in areas where you should never skimp on quality. Here are a few images of Daves sump and filtration unit. Like with all aquariums no matter how good your filtration is you will still need to test and conduct regular water changes to ensure the right conditions are provided for the inhabitants. Dave keeps his aquarium temperature between 72 -78F throughout winter and summer with the help of 2 x 300-watt heaters, Chiller, and a good quality digital thermometer. Sg is around 1.022-1.024 and Dave keeps a constant watch over all the parameters watching for any telltale signs of trouble ahead. For us, less is more and Dave has managed to achieve what most aquarists fail to do and that’s to find the correct balance of fish, corals, and invertebrates. However, I’m sure you’ve spotted the star of the show, Right! Daves amazing reef aquarium is home to a stunning and in perfect health Bluespotted Ribbontail ( Taeniura Lymma) ray along with a few other fish such as Green Chromis, Anthias and the small but cute Yellow Stripe Goby. These rays are born with a disc size of around 4″ attaining a maximum disc width of around 13″ and a total length of 28-30″ in an aquarium. It has been reported to grow bigger in the wild up to 35″ but evidence to back this up is hard to find. Still, at 30″ these are impressive stingrays. Most stingrays like to burrow in the sand but the Bluespotted Stingray are slightly different and prefer to stay in open water and show off their beautiful colors and spots. 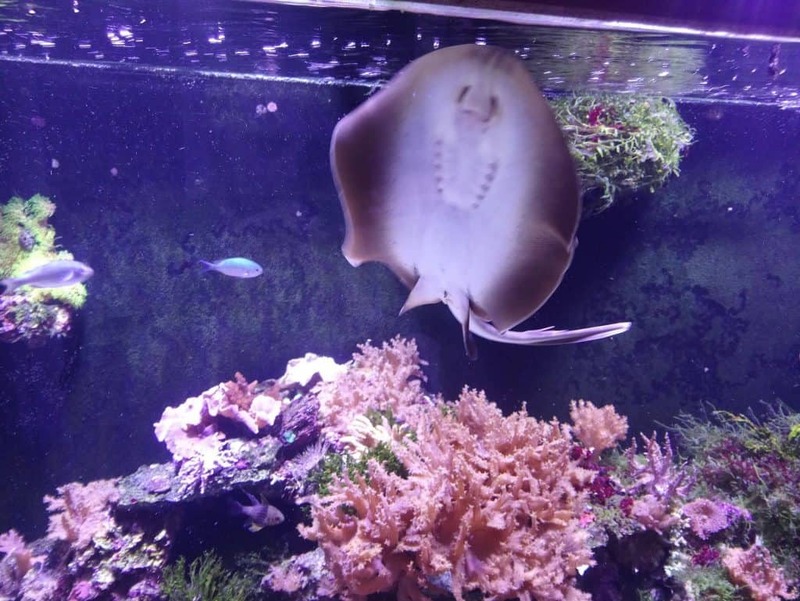 You need to ensure the correct substrate as these stingrays can easily hurt their underside on sharp rocks or unsuitable substrate and many people keep them in aquariums with no substrate at all just a glass-bottomed aquarium. Dave has provided the best possible setting for his Stingray, soft coral sand bed and plenty of rock for him to hide under. These fish can become stressed and require like most live species somewhere to hide in times of need. The majority of stingrays imported from the Philippines and Polynesia into the aquatic trade often die quickly and suddenly usually due to poor water condition or their choice not to accept foods. 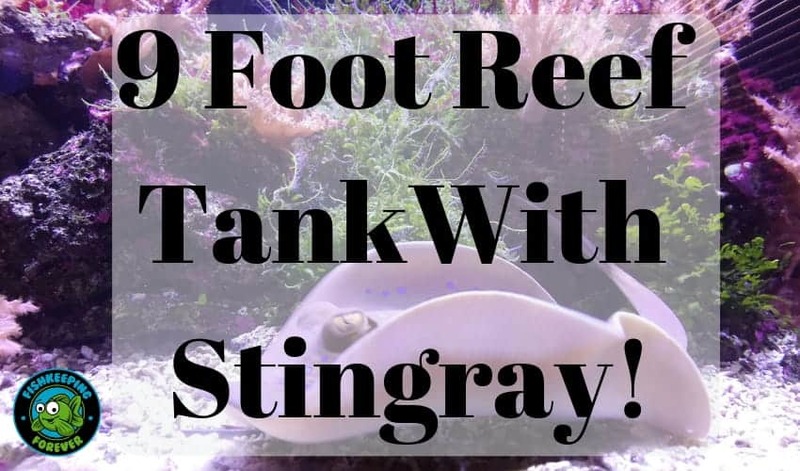 The Stingray is around 10″ in length and Dave has owned him now for around a year and the ray was a good size when Dave rescued the ray and Epaulette Shark for a small 3′ aquarium. Dave estimates the age of the ray to be around 3 years old. Stingrays need perfect water conditions and a varied diet. The equipment above and regular water changes provide the correct water conditions for keeping Blue Spotted Stingrays and a large volume is a must. A wider than normal aquarium is needed for obvious reasons and many people keep them in large heater and filtered pools. One of the things that impressed us the most about this aquarium is the quality of the corals and invertebrates within the main tank. 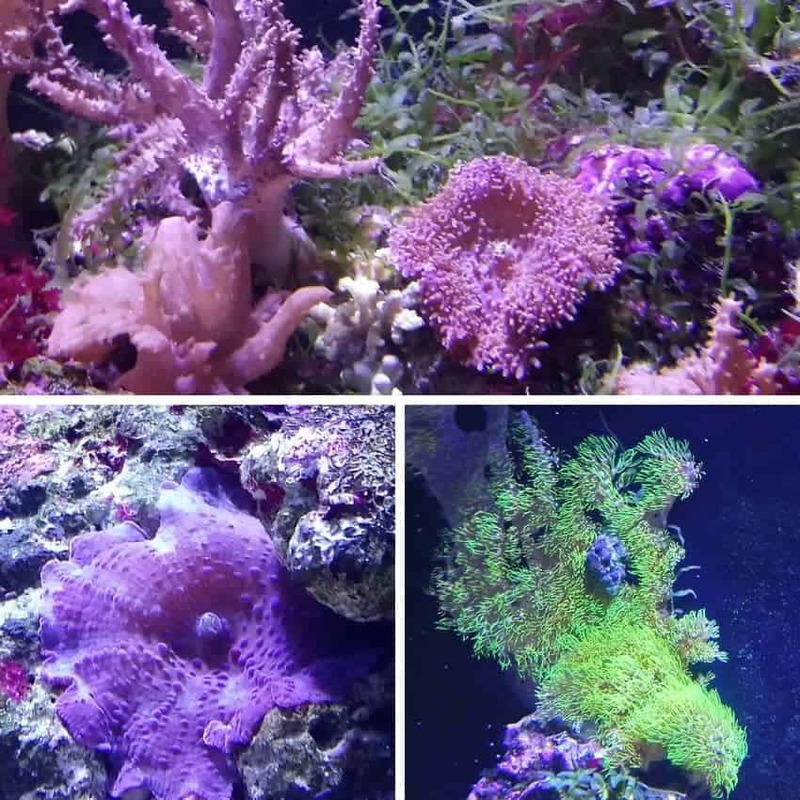 Dave not only provides the best water and lighting conditions for all his inhabitants but he thinks about the nutrient, nitrate and phosphate levels within the aquarium which is a really important part of keeping healthy corals and invertebrates. Take a look at some of the impressive selection of fish, corals and invertebrates below. The key to providing a healthy and suitable diet for most aquarium fish is to offer a variety of fresh foods. Don’t rely on dried flake foods to give your fish the healthy and nutritious diet they need. Dave feeds his aquarium a wide variety of foods listed below and always supplies them with the freshest foods possible. This is one area Dave will not skimp on! All chopped into small pieces for easy digestion. Dave feeds them small amount regularly and is careful not to overfeed them. We could talk all day about this amazing aquarium and we think it’s one of the best we have seen in a long while but we’ll let the video and images do the talking. Thank you to Dave King for sending in the information and letting us see your setup. You have hopefully inspired many to step out of their comfort zone and try to keep something a little different. Let us finish off with a short compilation video which you can find on Youtube all of the best bits from Dave’s reef aquarium.